What is The Cultivate Love Challenge? 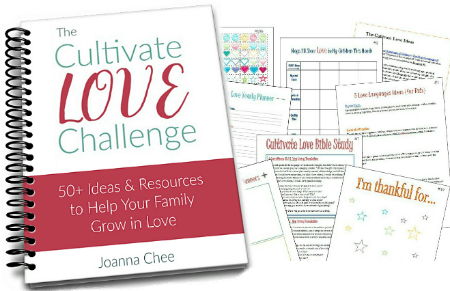 The Cultivate Love Challenge is 30 pages of ideas (and the planners and printables you need to put them into action) to strengthen your marriage, deepen your relationship with your kids, and help your children grow in friendship, all put together in a printable pdf. Put simply, it’s a fun-filled resource to cultivate love and deepen relationship in your family this year! I wrote The Cultivate Love Challenge because it’s something I want to do in my own family. I’ve had lots of ideas, and found some great resources, but have found it really hard to put anything into practice. Life just rolls on (and is full), and it’s often easier to stay where we are than to initiate change. Anyone identify? Then, just before Christmas 2015, I had this idea to put all my ideas (and good intentions) into a resource that I could make available to others (with planners and printables to help make it happen). Maybe together we could do this thing! And, so The Cultivate Love Challenge was born! I hope and pray that The Cultivate Love Challenge becomes more than just a resource. I pray it becomes a community of mums (and moms), learning together, and encouraging each other, as we press in to cultivate love and deepen relationships in each of our own families. Let’s cultivate love and deepen relationship in our families this year. PS. I’ll be pinning lots of extra ideas and resources to The Cultivate Love Pinterest Board. Follow me on Pinterest to access those. Sounds like a great resource! What a blessing that you are offering it free of charge – will pin for sure! Thanks for sharing at Literacy Musing Mondays!